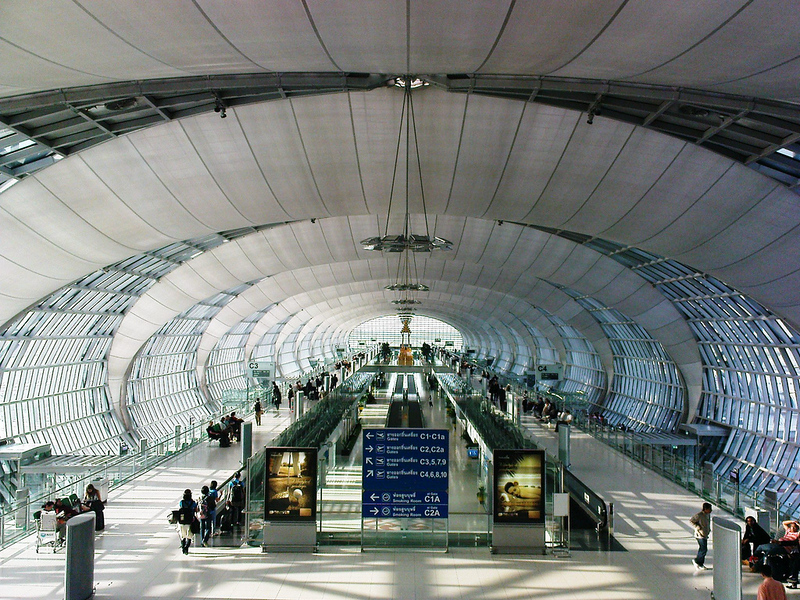 Suvarnabhumi International Airport is Bangkok’s largest and newest international airport. 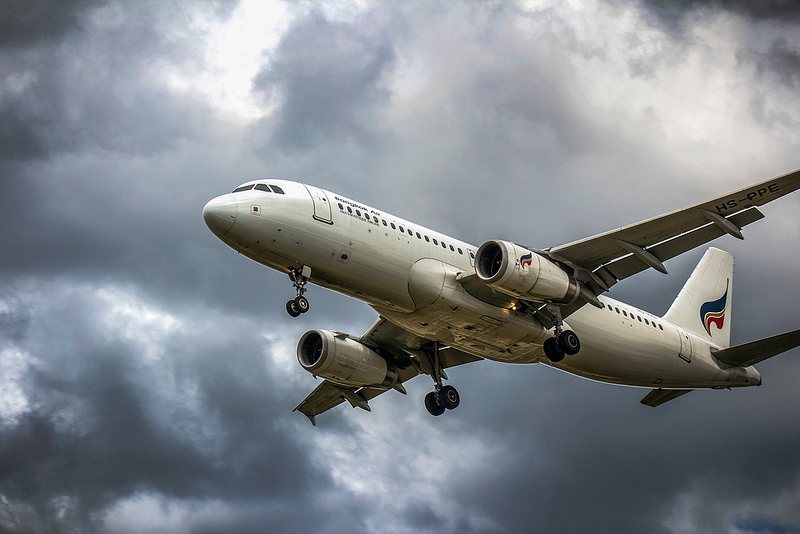 It handles most long haul international flights to and from Thailand, as well as a selection of short haul domestic and international flights. Don Mueang Airport is the smaller and older of the two airports, handling some international flights and a high volume of domestic flights. Most low-cost airlines that serve Thailand are based out of Don Mueang Airport. You can find flights and see which airport they arrive at in Bangkok on Skyscanner. The IATA airport code for Suvarnabhumi Airport is BKK and for Don Mueang Airport DMK. The two airports are located very far apart with no direct rail link. If you’re changing flights in Bangkok and need to travel between the two airports, it’s important to plan ahead and leave at least two hours to travel from one airport to the other. There is, however, a direct rail link from Phaya Thai BTS station in central Bangkok to Suvarnabhumi Airport. Suvarnabhumi Airport is Bangkok’s biggest airport, handling almost all long haul international flights in addition to a high volume of domestic flights. Open since 2006, Suvarnabhumi is one of Asia’s busiest airports and the busiest airport in Thailand by total flight activity. If you’re travelling to Bangkok from Europe or the South Pacific and not travelling on a budget airline, you’ll probably land at Suvarnabhumi. Suvarnabhumi Airport uses the IATA code BKK. Not sure how to pronounce “Suvarnabhumi”? It’s not as difficult as it looks – it’s pronounced “soo wan na poom”. The airport’s name translates to “The Golden Land”, a traditional name for Thailand and Indochina. Suvarnabhumi Airport has two international arrival areas and one domestic arrivals area. If you’re meeting someone at the airport, take note of their flight number so that you can meet them as they leave customs. Major airlines that use Suvarnabhumi International Airport include Air China, Air France, ANA, Bangkok Airways, British Airways, Cathay Pacific, Delta Air Lines, Emirates, Etihad Airways, Japan Airlines, Lufthansa, Qantas, Qatar Airways, Singapore Airlines and Thai Airways. A large number of small airlines and regional carriers also operate from Suvarnabhumi. Most Southeast Asia-based budget airlines that operate in Thailand fly in and out of Don Mueang Airport, which is Bangkok’s second airport. Suvarnabhumi is located approximately 30 km east of Bangkok with a direct highway link and rail connection to the city. Regular buses, train services and private taxis make it easy to get into Bangkok from Suvarnabhumi. Free cellphone SIM cards from AIS, DTAC and True Move — Thailand’s three biggest cellphone carriers — are available upon arrival on Level 2 of Suvarnabhumi Airport. Getting one of these means you can have cheap calls and data access while in Thailand. Free Wi-Fi is available throughout the terminal. The “AOTFreeWiFibyTRUE” network offers free connectivity for two hours. Passwords for other Wi-Fi networks are available from the airport’s information desks. There are several ATM machines in Suvarnabhumi Airport, as well as banks offering currency exchange. A VAT Refund Office, which is open 24 hours a day, is located inside the departure area. Car rental is available from several providers located on Level 2 of the terminal. As foreign driving licenses aren’t accepted in Thailand, you will need an international driving license to rent a car. If you’ve purchased goods worth more than 2,000 baht while holidaying in Thailand, you can claim back VAT. You will need to provide the VAT Refund Office with a copy of your original tax invoice and VAT refund application. Click here to view the full VAT refund requirements. Directly connected to Suvarnabhumi Airport, Novotel Bangkok Suvarnabhumi Airport offers a great selection of rooms. The hotel’s facilities include a large outdoor swimming pool, a spa and a fitness room for guests. Louis’ Tavern Transit Hotel is located inside Suvarnabhumi Airport on the fourth floor of the international departures area. This small hotel offers a selection of rooms for travellers that want to nap and relax between flights. Bookings are available from six hours upwards. Suvarnabhumi Airport contains a large King Power Duty Free shopping area, which offers a large selection of items at duty-free prices. The airport also contains duty-free boutiques from brands like Bvlgari, Cartier, Hugo Boss and Swarovski. King Power offers the usual airport duty-free products, including tobacco and liquor. Prices for most products are significantly lower than elsewhere in Thailand. While King Power inside the airport is a good place to shop for last-minute items, you’ll find a better selection of duty-free products in the King Power complex on Soi Rangnam, which is a short walk from BTS Victory Monument in Central Bangkok. In addition to King Power, a small selection of handicraft and souvenir shops are located in the terminal after immigration. Several retail shops selling men’s and women’s fashion and accessories are located on Level 4, Concourse D.
There are several convenience stores and pharmacies inside Suvarnabhumi both before and after immigration. A good selection of fast food outlets and restaurants are located on the 2nd and 3rd floors of the terminal. Numerous dining options are also available after immigration. Several fast food outlets are located in the basement near the Airport Rail Link station. The Airport Rail Link connects Suvarnabhumi Airport with the BTS Skytrain system, which is Bangkok’s primary public transportation system. The City Line connects with the BTS Skytrain at Phayathai Station and costs 45 baht from Suvarnabhumi. Metered taxis are available from Suvarnabhumi Airport to Bangkok. Taxis depart from the public taxi stand on the ground floor of the airport (one floor below Arrivals). There is a 50 baht fee on all taxis departing from Suvarnabhumi Airport. You are required to pay all expressway tolls on the way into Bangkok. Taking a taxi from the airport into Bangkok will usually cost between 200 and 400 baht plus tolls, depending on the location of your hotel and traffic conditions. Limousines are available from within the terminal at significantly higher prices than metered taxis. Prices for limousine taxis are calculated based on distance — expect to pay 1,000 baht or more to travel into Central Bangkok. There are currently no bus services directly from Suvarnabhumi to Bangkok. To get into the city by bus, you’ll need to board a shuttle bus from Level 2 of the airport terminal to the BMTA Public Transportation Centre. Buses depart from the Public Transportation Centre for major districts within Bangkok. There is a free shuttle bus between Suvarnabhumi and Don Mueang Airport (Bus No. 554) that can be caught from the Public Transportation Centre. The Airport Rail Link (ARL) connects with the BTS Skytrain at Phayathai Station. Trains run from 6 am until midnight, making the ARL a convenient way to travel to the airport without getting stuck in Bangkok’s infamously bad traffic. Bangkok’s awful traffic can make getting to and from Suvarnabhumi difficult, especially if you are travelling during the morning or evening rush hour. Allow at least one hour to travel to the airport from Central Bangkok, or longer if you’re travelling in the morning or evening. Most taxis within Bangkok will take you to the airport. As usual for Bangkok, turn down taxis that refuse to use the meter. Your hotel staff will be able to call a taxi to the airport for you if you’re concerned about being overcharged or refused by a driver. Bangkok’s oldest airport, Don Mueang International Airport closed once Suvarnabhumi was built but has since reopened to deal with the high volume of domestic and international flights into and out of Bangkok. Most low-cost airlines operate from Don Mueang. If you’re flying into Bangkok on AirAsia, Nok Air, Thai Lion Air or any of Southeast Asia’s other low-cost airlines, you’ll probably land at Don Mueang Airport (DMK). 15 airlines operate from Don Mueang Airport. The most popular airlines that use Don Mueang are AirAsia, Nok Air, Scoot Airlines, Milindo Air, Thai Lion Air, Thai Smile and Tiger Air. Most private flights into and out of Bangkok are based at Don Mueang Airport. While Don Mueang Airport is significantly smaller and less modern than Suvarnabhumi, it has all of the usual comforts and facilities you would expect from an international airport. Don Mueang Airport contains a King Power Duty Free shop, although the selection is limited compared to the large King Power complex on Soi Rangnam. A decent selection of liquors, wines and tobacco products are available inside the terminal at competitive prices. 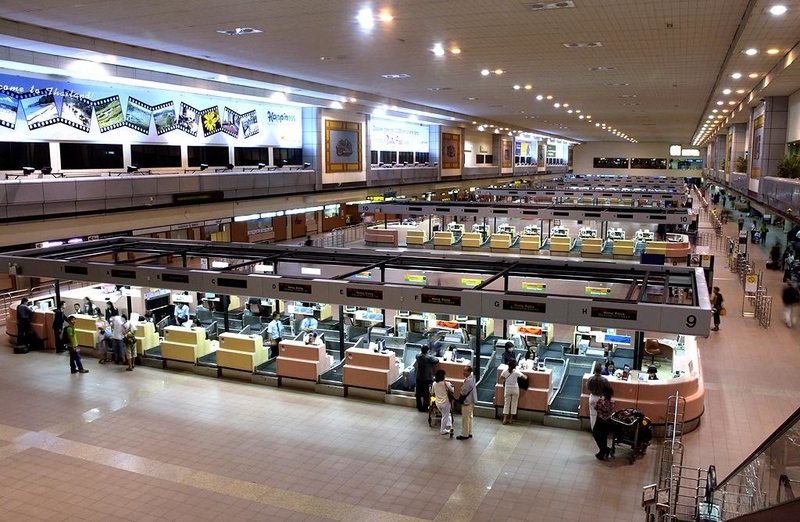 A selection of fast food outlets and restaurants are located inside the terminal. Food can be purchased before and after check-in and immigration, with a selection of restaurants close to boarding gates including Fuji, Burger King, Starbucks and Subway. There are numerous ATMs inside Don Mueang Airport, as well as several currency exchange booths. SIM cards for AIS, Dtac and True Move are available from the 7-11 located inside the terminal. Car rental is available from Avis, Hertz, VIP Cars and several other rental agencies. You can book or pick up rental cars from the agency offices inside the terminal in the Arrivals area. Are you transferring between Don Mueang Airport and Suvarnabhumi Airport? There is no rail link between the two airports. In order to reach Suvarnabhumi, you can board bus 554, which is a free shuttle between the two airports. Private taxis are also available. Although it takes less than one hour to transfer between the two airports in ideal conditions, it can take two to three hours in bad traffic. Make sure you have at least two hours to travel from one airport to the other, especially if you need to transfer during Bangkok’s rush hour. The four-star Amari Don Muang Hotel is connected to Don Mueang Airport by air conditioned walkway, making it a convenient option if you need to stay near the airport. Rooms are large and comfortable, with a swimming pool and fitness room available for guests. Although Don Mueang is technically connected to Bangkok by SRT surface rail, it’s far easier to travel to and from the airport by taxi. Taxis depart from the public taxi stand, which can be reached by walking to the far left of the terminal after exiting customs and baggage claim. There is a 50 baht surcharge for taxis departing Don Mueang Airport. The airport is about 30 minutes from the city centre by road. Travelling to most destinations in Bangkok will usually cost around 150 to 300 baht excluding expressway tolls, depending on traffic. Since Don Mueang Airport is located in a residential and industrial area of Bangkok, traffic to and from the airport can be a serious problem during rush hour. Allow at least one hour to get to the airport if you’re travelling early in the morning or in the evening. There is no departure tax at either of Bangkok’s airports. Since 2007, the 700 baht departure tax has been included in the price of air tickets into and out of Thailand. Holders of most Western passports receive 30 day visa-free entry into Thailand. This can be extended for a further 30 days at all Immigration Centres in Thailand. You may be requested to show proof of onward travel if you enter Thailand on a 30 day visa waiver. Tourist visas are available to most nationalities, allowing 60 days of entry into Thailand. This can be extended for a further 30 days at all Immigration Centres in Thailand. Single, double and triple entry tourist visas are available for foreign passport holders travelling to Thailand. Note that you will need to apply for a tourist visa outside Thailand before entering. Tourist visas are not available upon arrival, aside from 15 day tourist visas which are available for select countries. Click here to visit the Thai Ministry of Foreign Affairs website and learn more about Thailand visas.